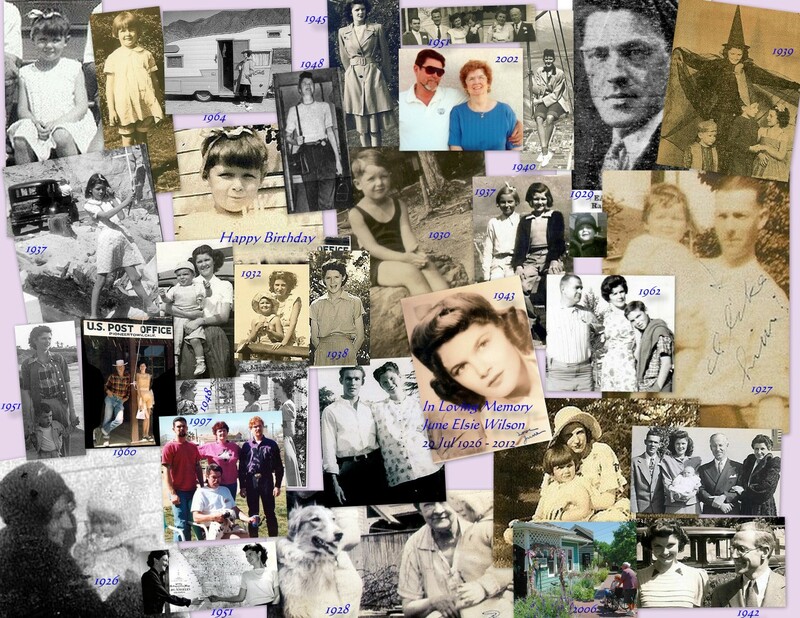 This is my Personal Story, Based on a True Story and Events dating back to 1793 (which as of 17 Mar 2014 has been updated) of why I started my genealogy research, the discoveries I have made and most of all, answers. My New Year 2017 Announcement, after 23 yrs of beginning to research 1993 or was it 1992, having not met my biological Father for the first time until I was age 20, prior I did not know his name or what he looked like, then came that day we met, followed with meeting my paternal grandmother Thelma, a half brother and 3 half sisters, and a glimpse of my Uncle...and for the next 26 years after that meeting, I learned my Father was not born Richard Newton Young, rather Newton Richard Begnal, as I never had a reason to question or ask my Father about his growing up, I was too happy to have a Father. Little did I know the journey I was about to embark on when in tribute to my Grandmother Thelma having past in 1979, and with my Life's situation at the time in 1992, I turned to Genealogy Research. My Father passed on 3 Jan 1995, 22 yrs ago. My Mother had no answers about my Father's Life and did not know he was born Newton Richard Begnal, she June E Wilson passed on 6 Dec 2012. For many years I had a strong suspicion, that my blood line was not that of Young or Begnal, based on facts and events of a man I thought was my biological Paternal Grandfather, once I had obtained my Father's birth certificate in 1994. At that time I could ask my Father, which he did not offer up anything but he was a Begnal, and did not know his Father Clifford Franklin Begnal. My Father who I shall refer to as Richard, was born in San Francisco 1924, as was his brother Clifford Anthony Young 1923, also born as Begnal. Thelma had passed on 1979, so I could not ask her about how Richard and Clifford Anthony came to have the last name of Young, were they adopted, especially since now that I had both birth certificates, showing parents as Clifford Franklin Begnal and Thelma Fern Perry. I do have Rose in my Lineage, however Thelma F, given or middle name does not begin with an E. The School Records also list a Step-Father of William Irby, this man I knew about, but never met as he died 1 Dec 1959. As you notice, I would of never found Thelma and the Boys searching for her as a Begnal, Young, Irby, or Perry, if she had divorced and used her Maiden name. 9 Apr 1930, San Francisco, the school records show Richard as attending 3 Sep 1930, with the first school in San Pedro CA, Los Angeles County 400 miles from San Francisco. The question becomes who is Robert Benesh, did Thelma marry him too, when did Thelma meet and then marry Clifford Franklin Begnal ? The answer to when married came on 17 Mar 2014, after 21 yrs, searching, as Ancestry finally had 2 counties indexed of marriages in the database of "California, Marriage Records from Select Counties, 1850-1941"
New Hope, George Begnal (1879-1957) now becomes my Great Grandfather, not so quick...I already knew of George's name from Records searching for Elizabeth Shaughnessy. Only now, what is the real story behind these events, and to make matters worse, Newton Richard Begnal becomes Richard Newton Young, 1941 SS5 App dated Social Security Application 18 Nov 1941 shows Newton Richard Young, Father as Clifford F Young and Mother as Thelma Fern Perry, living in Los Angeles City. 28 Mar 1942 Richard N Begnal marries in Yuma, AZ, his mother is witness as Thelma Fern Irby, as is his step-father William Irby. 24 Jan 1945 Richard Newton Begnal's 2nd daughter is born as Begnal, by 1 Jun 1945 she is adopted, not the 1st daughter and the Mother completes an Affidavit stating that Richard Newton Begnal is not the biological Father of either Girl. If Mother was pregnant with 2nd Daughter in Jun/Jul 1943 she could not have become pregnant by Richard or somehow Richard went home to CA, or Mother went to Louisiana, it might have been his child. And could the reason to release Richard from any and all responsibilities, was the Affidavit a lie ? I really never met my Uncle, and he too has passed 4 May 2012, so to match my Father & Uncle per DNA I feel would be difficult since they both are deceased. I have a Half Brother, and 3 Half Sisters from different marriages of Richard, two half sisters since passed, unknown of my Half Brother, who has a different Mother from the 3 girls, as does Richard's first 2 Daughters have a different Mother. Totaling 7 children from 4 different Women. My Father & Uncle do not appear to be Brothers by appearance and stature, I always felt my Paternal Grandfather Clifford Franklin Begnal was not the biological Son of George Felix Begnal (1879-1957) and given the times it would be easy to assume a name, without the need for proof. As I do not know what Proof Thelma F. Perry offered when enrolling Richard in School 1930 when his birth certificate clearly shows his birth name as Begnal, not Young. Also the same of when Richard applied for a Social Security Card in 1941, and joined the Army in 1942, what proof did he have to show he was Richard Newton Young. I recently dug deeper into my mother and father’s ancestry documents and found what appears to be the solution to the conundrum you mention about Clifford Franklin Begnal parentage. Your research and instincts were right. Clifford’s parents were not Lizzie Shaughnessy and George Begnal. It turns out that Lizzie had a previous marriage. On June 13, 1900, she married Claude B. Eaton, and this union gave birth to Clifford Franklin in 1903. What happened to this first marriage, I don’t know nor do I know why Lizzie decided to change her son’s name to Begnal. I suppose that was the convention at the time, and that it was still shameful for a woman to be divorced or to have a son with a different father’s last name. I have attached a number of documents, letters, and pictures that clearly show some of Clifford's story. Most poignantly, I found a letter from Clifford in 1928 at the age of 25 to his Aunt Louise Shaughnessy asking her what his true name was." I have never met my 2nd Cousin, I give him my deepest gratitude in finding what can possibly answer my question of over 23 yrs, sadly my Father & Uncle have passed and they shall never have gotten to know their Father, or Grandfathers as I have and continue to learn more. Until I receive proof of my Grandfather having not been born Begnal, I hope he was born as Eaton, I will be mystified, if this turns out any other way. My research is a tribute to my ancestors, a gift to my family and Our Ancestor's descendants. I offer this story to you, as encouragement and to continue...even at difficult moments when you are about to give up. The personal reward I feel is tremendous. I never met my father until I was 20 (1968). My mother kept his whereabouts unknown. So naturally when I met him, I had a whole new family, father, step-mother, a half brother, three half sisters, an uncle, three cousins and a grandmother whom I never knew or met, Thelma Ferne Perry. My grandmother Thelma Ferne Perry's eulogy card stated she was born in Auburn, ME. I sent off for her birth certificate which lists her father as Anthony D. Perry, born in Taunton MA. Finding no records anywhere of his birth, I called my cousin Ginger. I learned that Anthony had come to CA and worked at a lumber yard in Hayward, CA. I searched the CA death indexes, found him, and sent for his death certificate. He was born in Portugal and his father was Antone Cardozo Pereira. Ginger also told me about a second cousin twice removed, Jesse Russell Rose whose grandmother was Rita Perry, daughter of Antone Pereira Cardozo III. Since then, one thing led to another. Most of my research at first was at a Family History Center, and documenting my finds on the computer. The volunteers at the family history center were very helpful, they are the ones who first told me that Perry could be Pereira. One search turned up a family group sheet of Antone Perry and from the information of who provided this information to the church, I contacted them. They turned out to be a second cousin once removed Edgar Allen Smith. I came to find there was a manuscript written by another first cousin twice removed Richard Edwin Luiz of our Portuguese ancestry dating back to 1807, how our surname came to be Perry, pictures I never saw, nor had my father and the immigration and migration of the Pereira Cardozo Family Story. When I sent for my fathers birth certificate and my query came back without a find for the name of Richard Newton Young. While he was alive I asked my father about his birth, and he said, he was born a Begnal. How did we become Young? He didn't know. I sent for his birth certificate a second time as Richard Newton Begnal. It came back Newton Richard Begnal and his father was Clifford Franklin Begnal. Like my other grandfather I never met him either, nor had my father. Again I checked the death indexes, and located a death certificate for Clifford Franklin Begnal, he died in 1960 in the line of duty for the South San Francisco Fire Department. On his death certificate stated Clifford F. Begnal Jr. submitted the death info. I located Clifford F. Begnal Jr. who in turn called me. I asked, if his father Clifford Franklin ever mentioned my father Newton Richard. He said, no and that he had two other brothers as well. I called my father and told him about his father, grandfather and 3 half brothers. George Begnal was listed as Clifford Franklin Begnal's father. Another Begnal, Robert replied to my letter, and Robert stated that his father George Begnal was 55 years old at the time of his birth. This confirmed to be the same George Begnal as Clifford's father. I received e-mail from a woman in Oregon one day and she said, she was married to one of Clifford Floyd Begnal brothers. She sent photographs of my grandfather Clifford Franklin Begnal and his three sons from his second marriage. Unfortunately my father died in 1995, and was not able to meet Clifford Floyd Begnal or his surviving brother or see photographs of them. By coincidence Robert Begnal moved within 7 miles of me from Saratoga Springs, NY. Having never met my grandfather Earle Kenneth Wilson nor had my mother, I located his death certificate and on his 1985 death certificate, stated Gayle Parker submitted the death information. I mailed her a letter asking how she knew my grandfather. She replied, she was his daughter. I called my mother June Elsie Wilson, and told her of her half sister, not one but two others (twins). Gayle was able to send photo's of not only my grandfather at age 1, 24, his mother, her mother, and my gg-grandfather Charles G. Wilson. One picture of my grandfather Earle Kenneth Wilson in a newspaper dated 14 Apr 1929, was taken before his leaving for Los Angeles, CA. 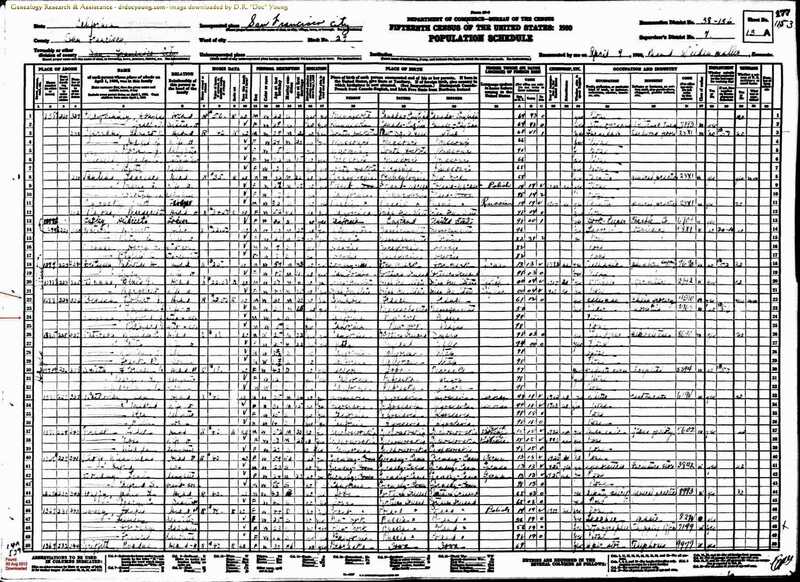 My mother thought her father was never CA, however I found him in the 1930 census in Los Angeles, but I am not able to find my grandmother and mother in this census. From the divorce filing by my grandmother, states my grandfather left in 1929 for Los Angeles from New Haven CT. That in December 1930, my grandmother and mother headed to CA to be with him and about 21 Dec 1930, Earle abandoned them. I knew from my Mother that we were of Hungarian descent and her mother Antonia Victoria Belasco came to American after the turn of the century. It was not until 1997, when my mother dropped off my grandmothers personal effects, did I find newspaper articles about my Hungarian ancestors and photographs. Her grandfather John Blaskow per a Connecticut newspaper article dated 26 Jul 1936, was a Captain in the Austrian Guards and served directly under Emperor Franz Josef.. He was in the Turkish-Prussian war and after retirement from the army, he went into the wrought iron business in Vienna. He came to America in 1904, after becoming troubled with rheumatism in 1897. The doctors advised a change of climate would help and he came to America. I found a Johann Blaschkow, age 22, a workman from Hungary listed 5 Oct 1883, from Bremem, Germany on the Immigrant Ships Transcribers Guild SS Strassburg passenger list. This places his birth about 1861. This is confirmed by the newspaper article stating John Blaskow of being age 75 at the time of the writing. However, in this newspaper article states John coming to America in 1904. This raises more questions, did he go back and forth to Vienna between 18?? and 1904? Per my grandmother's social security application dated 14 July 1959 at age 58, was born 7 Jun 1901, her father as John Belasco and her birth name as Antoinette Victoria Belasco, born in New York City, NY. However, by the passenger list puts her being born in 1904. 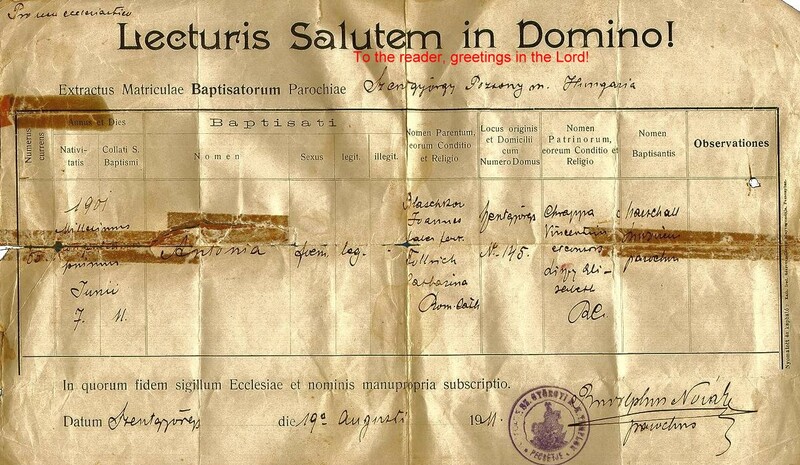 Her baptismal places her birth in 1901, born in Szentgyörgy, Hungry. Now for the real coincidence. I never knew any of my lineage until 1994. At that time, I had been a firefighter for 22 years. Charles G. Wilson was a fireman for Fair Haven CT about 1890's (one of the pictures sent by Gayle). Clifford Franklin Begnal, died in the line of duty working for the So. San Francisco Fire Dept., Anthony D. Perry occupation on my grandmothers 1906 birth certificate, was fireman. My cousin Clifford is a Paramedic in CA. It has been said, that I have other relatives who were a Fire Chief and a Captain for Richmond, CA Fire Department.